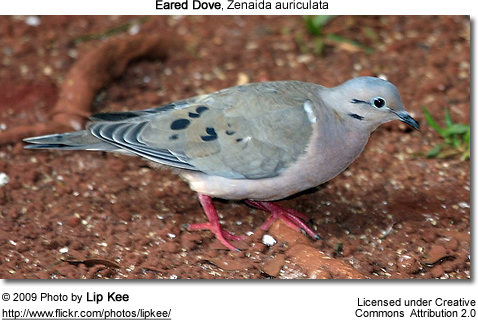 The Eared Dove, Zenaida auriculata, is a New World tropical dove. It may be a relatively recent colonist of Tobago and Trinidad. It appears to be partially migratory, but details are little known, although migration may be driven by food supplies. 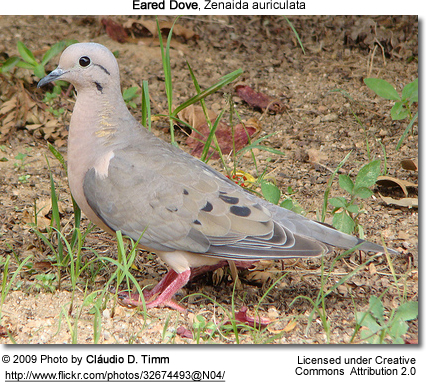 The Eared Dove is common to abundant in savannahs and other open areas, including cultivation, and it readily adapts to human habitation, being seen on wires and telephone posts near towns in Trinidad and Venezuela, and feeding near beach resorts in Tobago. It builds a small stick nest in a tree and lays two white eggs. These hatch in 12-14 days with another 9 days to fledging. It has a breeding display with a steep climb and semi-circular glide down to its original perch. The call is a deep soft oo-ah-oo. Its flight is high, fast and direct, with the regular beats and an occasional sharp flick of the wings which are characteristic of pigeons in general. The Eared Dove is 24cm long with a long wedge-shaped tail, and weighs normally about 112g . Adult males have mainly olive-brown upperpart plumage, with black spots on the wings. The head has a grey crown, black line behind the eye, and the blue-black on the lower ear coverts (feathers covering the ears). These black markings give the species its English and specific name. The underparts are vinous, and the tail is tipped with cinnamon. The bill is black and the legs dark red. The female is duller than the male, and immatures are greyish-brown, very dull, and have pale barring. Eared Doves feed mainly on seed taken from the grounds, but will take other items such as soaked bread. They can be agricultural pests. This is a gregarious bird when not feeding, and forms flocks especially at migrations time or at communal roosts. Eared Doves provide the last big-bag shooting experience in the world. There are reckoned to be more than 23 million of these doves in the fields around Cordoba in northern Argentina and it is not unknown for a single gun to shoot 1000 birds in a day. The scale of this wing-shooting recalls the numbers of Passenger Pigeons taken by North American gunners in the 1800s. 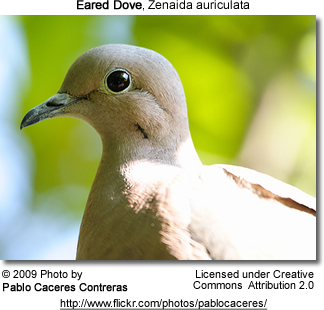 That hunting pressure brought the Passenger Pigeon to rapid extinction, but the Eared dove seems to be more resilient -- populations on the sporting estates of Argentina are holding their own, with the birds breeding four times a year and thriving on the vast acreages of grain, some grown for their benefit, most of it on commercial farms which are happy to support the dove shooting. The Estancia de los Chanares, one of the luxury lodges which specialise in dove hunting, estimates that there are one million doves on this estate alone and the season extends right round the year. The Eared Dove is a close relation of the North American Mourning Dove and some authorities describe them as forming a superspecies. The Eared Doves around Cordoba do not migrate and the enormous flocks are described as flying constantly between their roosting woods and the open fields. Further north, in Bolivia, the dove shooting is more seasonal with large flocks arriving from Argentina to raid the grain crops.